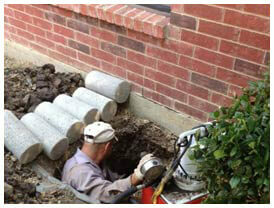 For Haltom City Foundation Repair, Call HD Foundations. Stop Crack Damage And Learn Costs. Searching for foundation repair in Haltom City TX due to fractures and other forms of damage? Hire HD Foundations. Our company stops deterioration. We offer a lifetime guarantee, provide cost estimates at no charge and are experienced local contractors. 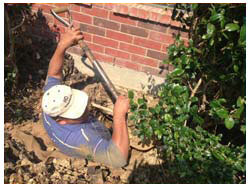 When you need foundation repair anywhere in the Haltom City area, call HD Foundations. We provide free foundation evaluations. About Foundation Repair In Haltom City, TX. If you have foundation deterioration and cracking, it’s important to get your foundation fixed. The clay soil found in the Fort Worth area can cause lots of harmful issues in your foundation and create big gaps. You may need cracked foundation repair to prevent serious problems. That’s why you should enlist the best Haltom City foundation repair contractors for residential and commercial service. We’ll put a stop to foundation settling and upheaval. Call HD Foundations about issues because we’re a Better Business Bureau-affiliated company (BBB) with an outstanding rating. We stop foundation damage. When you need repairs on slab cracks, you can rely on us to make them correctly and make sure your foundation is stable. We’ll be happy to tell you about our process for making houses level. It’s an effective procedure. 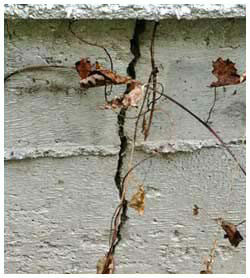 At HD Foundations, we terminate all types of harmful cracks by elevating your foundation and making it level. By doing this, we can prevent bending and breaking in your foundation. When studying the cost for repairing foundations in the Haltom City area, you’ll find that fees can range from less than $1,800 to well over $10,000. Fees depend on the state of your foundation and the quantity of steel foundation piers or pressed concrete foundation piers you need. Either way, all of our Haltom City customers get a superior lifetime foundation repair warranty. The many things affecting the cost of fixing a foundation include: (1) How extensive your structural foundation damage is (2) What type of repairs must be made (3) How large your foundation is and how out of level it has become (4) Which areas must be fixed (5) The extent of deterioration on your cracked concrete slab. It’s possible that you won’t even require Haltom City foundation repair. (6) The extent of rotting in pier and beam foundations. Prices for repair service are basically the same in all areas of DFW. HD Foundations will examine your pier and beam structure for wet crawl space problems, too. If you think your property is damaged, let us know. We provide cost-effective service on commercial properties as well as houses in the Haltom City area. Schedule a free foundation repair estimate and foundation evaluation online today. Or just phone the contractors that do expert work. At HD Foundations, we service the entire DFW metroplex.